Digi-Schlock: NIGHTMARE CASTLE (Severin Blu-Ray) – Schlockmania! In recent years, Severin has dabbled in taking films that were abandoned in the grey-market wastelands of home video, rescuing them and giving them proper, remastered editions. The two examples of them doing this are their blu-ray editions of Horror Express and The House Of Seven Corpses. 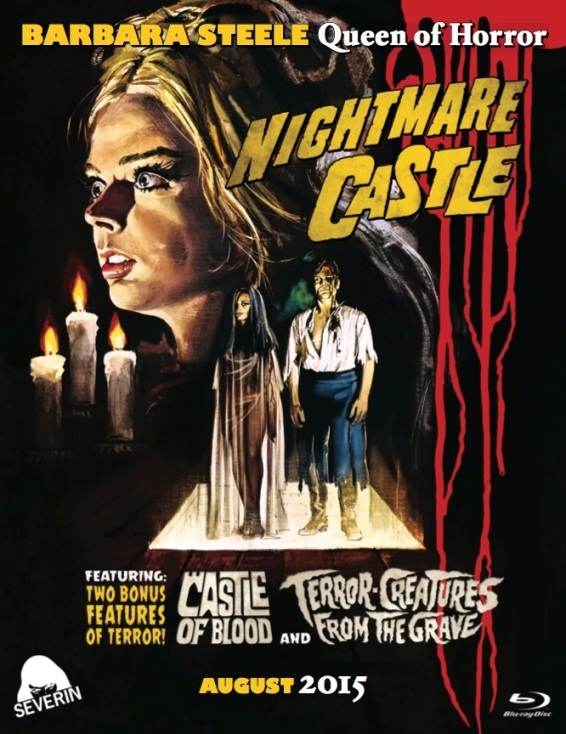 However, they’ve trumped those releases with their blu-ray redux of the Italian gothic horror cult fave Nightmare Castle. Not only have they given it a gorgeous-looking treatment high-def, they’ve also packed the disc to bursting with extras – including an additional two Barbara Steele film vehicles! The transfer of Nightmare Castle here is terrific, bringing out all the richly textured details of Enzo Barboni’s lush black-and-white cinematography. This is the full, uncut version of the film and it is presented in its original 1.66:1 ratio. The audio sticks to the original English dub for the film and it is presented in LPCM style: it’s sounds nice and crisp, with no distortion or other defects. It’s also worth noting that Severin found the space to include not one but two other Italian gothics that feature Steele in their casts, Castle Of Blood and Terror-Creatures From The Grave. Both are taken from vintage prints of the U.S. release versions. Neither has been subjected to the rigorous clean-up process applied to Nightmare Castle so you can expect some splices, print damage and a bit of distortion/hum on the soundtracks from time to time. That said, both films look and sound mostly good and their generous inclusion makes this disc a de-facto Steele/Italian gothic triple feature. And that’s just the beginning of the bonus features: indeed, each of the three films included here have extras devoted to them. Better yet, there is also a fun career retrospective interview with Steele from 2009 to kick it all off. Over a half-hour she discusses the winding path of career, which included English art school, an abortive career as a Hollywood studio contract player, a long sojourn in Italy and even work as a t.v. writer/producer. There are stories about Elvis Presley, Jonathan Demme and David Cronenberg in there as well as reflections on the Italian filmmakers she worked with – and she tackles it all with brio and wit. In short, it’s a must-watch for her fans. Nightmare Castle gets a trio of its own extras. The first is a commentary track that pairs Steele with moderator David Del Valle. Despite the occasional gap, it’s an involved discussion that covers Steele’s thoughts on her Italian work, Del Valle’s critical analysis of the film and thoughts from both on Steele’s career. She’s frank about how her outlook has changed over the years regarding her work in horror. Also included on the Nightmare Castle tip is a 14-minute interview with director Mario Caiano. He discusses how his childhood passion for gothic literature influenced the film, what it was like to work with the different cast members and some interesting details on Barboni’s photography and the Ennio Morricone score. The final inclusions for this title are the U.S. and U.K. versions of the trailer for this film, which play up its perverse edge and Steele’s iconic screen presence. Terror-Creatures From The Grave also gets a trio of its own extras. A 26-minute featurette features actor Riccardo Garrone and critic/journalist Fabio Melelli. Melelli shares a vintage audio interview with director Massimo Pupillo that clears up the mystery behind his “Ralph Zucker” pseudonym while Garrone shares some scathing, hilarious memories of the film and Pupillo. There are also 14 minutes’ worth of deleted scenes, including a more involved intro to set up the film’s mystery as well as an alternative death scene for a character. The last Terror-Creatures extra is its trailer, a scare reel that plays up its supposed Edgar Allan Poe inspirations. Castle Of Blood gets two extras. The first is a 17-minute featurette that combine comentary from Melelli as well as samples of an audio interview he did with Antonio Margheriti. That interview yields a lot of interesting material, including how Margheriti got the directing gig from colleague Sergio Corbucci and the tale behind his pseudonym. There is also a trailer for the film’s U.S. release that again presents it as a faux-Poe adaptation. All in all, this set of Nightmare Castle is one of the best values that a fan of European horror will get this year: a great presentation of the main attraction, another two titles in the same vein and scads of extras for all the films. 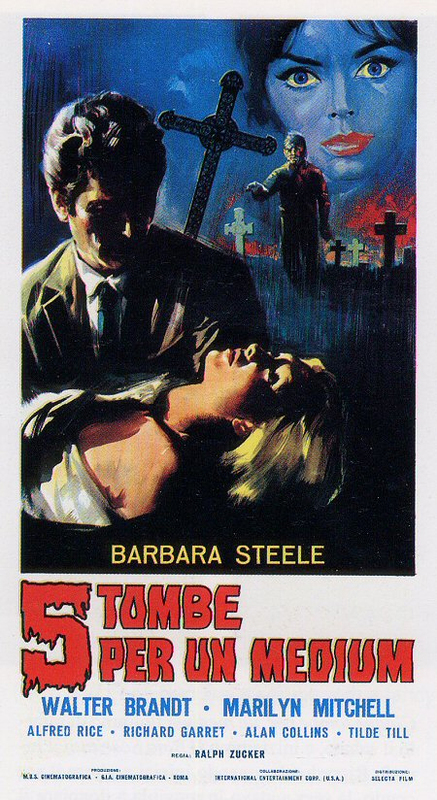 If you have any interest in Steele’s work or Italian gothic films in general, you’d be a fool to pass this release up. 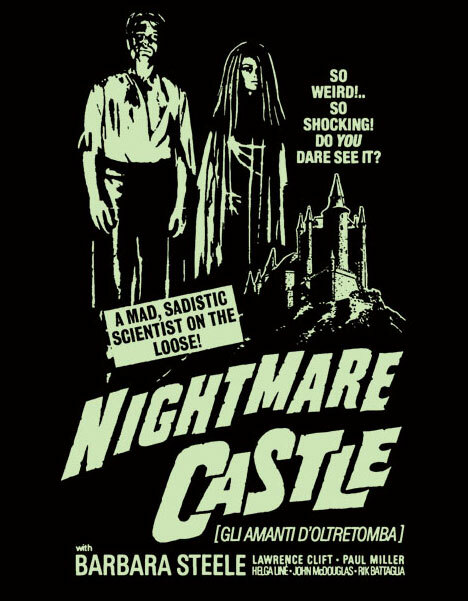 To read Schlockmania’s film review of Nightmare Castle, click here. To read Schlockmania’s film review of Terror-Creatures From The Grave, click here. 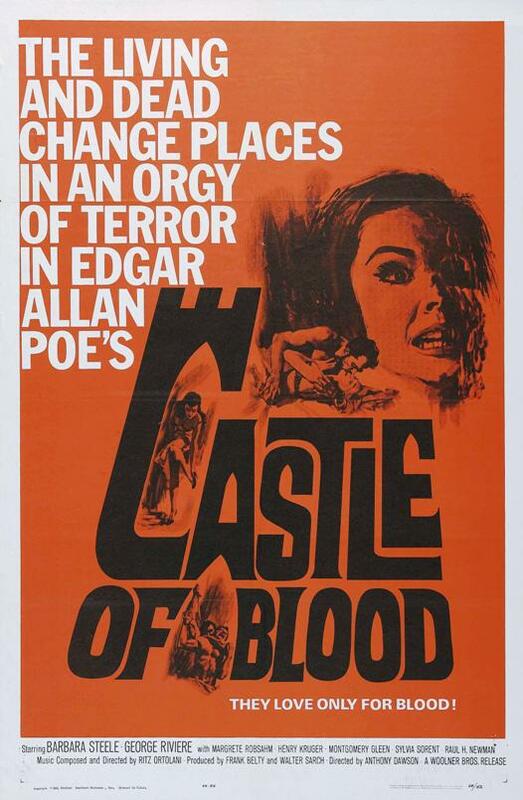 To read Schlockmania’s film review of Castle Of Blood, click here.